Most of us have a healthy respect for wasps, probably because we have all been stung by these creatures at some point in our lives. Last year I wrote an article about mud dauber wasps. These are a type of wasp that make nests of mud and lay their eggs inside. In general, mud daubers are not aggressive and their sting is not as painful as that of the wasps which make paper-like nests. As a result, when I find a paper wasp nest in an area where we are frequently working, I generally remove it. Here's a small one I ran across last month. The paper-like material these nests are constructed of contains finely chewed wood fragments and salivary secretions of the wasps. The wasps were just getting started on this nest and, being the inquisitive person that I am, I tore it open. Inside, I found these tiny wasp eggs. Given time, the wasps would have caught and stung stung spiders to paralyze them. Then they would have sealed a spider in each of the cells of this paper nest, just like the mud daubers did inside their mud nests. It is well into the fall season now and I've not seen any wasps of any type in several weeks. That's because male wasps die off at this time of year, while the pregnant females look for a protected place to spend the winter. They will emerge next spring and the cycle will start anew. Ever so often, we have a mice problem in the hen house. This is not to be unexpected because the chicken feed contains grain and attracts mice. Normally, we pick up the feeder at night and hang it from a hook suspended from the ceiling, so at least the feed is not as readily available to the mice at night when they are most active. However, in spite of our best efforts, we have to set traps occasionally in order to control them. We could use poison, I suppose, but I hate to see any creature suffer, and poison is a horrible way to die, even if you are a mouse. Besides, I wouldn't want the chickens to eat a mouse that had died from poisoning. And, they do eat mice, if they can catch them. Last week, we saw a couple of mice in the chicken coop and decided it was time to set out traps. We normally set the traps in a storage area next to the coop where the chickens can't get in there and disturb them. Tom set 3 traps, baited them with peanut butter and caught 2 or 3 mice. Then one morning when he went to check the traps, they were gone. After searching high and low, he finally found them under a set of steps with partially eaten mice in them. We figured something had found the dead mice and eaten them, but what?. So, Tom got new traps, drilled holes in them and tied string to them while tying the other end of the string to a post. The next morning the traps were all sprung, but no mice were in them. At this point, I decided to place the wildlife camera in the shed to see what was going on, and this is what I found. A young "possum" was the culprit. See him on the step? We don't know if he was attracted to the dead mice or the peanut butter. At any rate, possums are well-known killers of chickens, so we had to find a way to get rid of him. Fortunately, we have a "live" trap we acquired at some point in the past. Tom set it with some cat food for bait and caught the little guy. He is not fully grown, only about half the size of a grown possum. In fact, I'm not sure a grown possum would fit in this trap. He was probably born this spring. His method of defense was to issue a loud "hissssss" and show off his sharp teeth. At no point did he "play dead" as possums are known to do. Tom hauled him off several miles to a creek bed where he should find plenty of food and be well away from any houses or chicken coops where he might get into trouble again. Hopefully, this encounter with humans will have taught him to stay well away from houses and chicken coops. Otherwise, he might not be as lucky the next time. My how time flies! I realize it has been a while since I posted anything about the chickens, but had no idea how long until I looked back and found the last chicken post was in June! In my defense, I have posted a few updates to our Windy Acres Natural Farm Facebook page, but those were short with little detail. So it is time for a more in-depth report. The last chicken entry was this one Chicken Introductions where we introduced the chicks we purchased in April to the old hens. It was pretty dramatic for a few weeks, but the social issues have pretty much been worked out and peace and order have been restored to the flock. The chicks we bought are Rhode Island Reds. We got "straight run" chicks. Straight Run means the chicks are not sexed, i.e. you don't know if they are male or female. As it turned out, of the 8 chickens, we had 4 of each. It took several months before we could tell the difference. 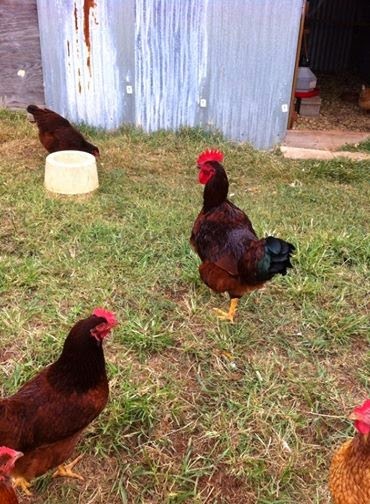 But, when it became obvious that we had 4 roosters, we had to figure out what to do with them. With our small flock of 7 hens, it would be stretching it to keep even one rooster, much less 4. My rooster dilemma became the source for many jokes among our friends, several of whom offered to lend me guns or otherwise help eliminate the problem. The rooster we kept grew into a handsome fellow and I named him Pretty Boy and here he is. It is not obvious in this picture, but his legs are a lot longer than those of the chickens and he towered above them. He was also somewhat intimidating. I've heard stories of mean roosters who "flog" people, that is fly up and strike at you with their spurs (long toenails that grow from toes on the back of their legs). As you notice, I am speaking of him in the past tense. That's because the guy I bought him from called the other day to ask if any of the chicks he had sold me were roosters. If so, he wanted to buy one of them back because coyotes had gotten into his flock and killed both his prize roosters. I was relieved to have a humane way to get rid of him. The hens don't seem to miss him much. In fact, the younger hens seem to associate more with the older hens now that he is gone, which I view as a good outcome! I am the one who goes around taking pictures all the time and, many times, Tom is the subject of my photographic efforts. He is good natured about this. In fact, he is good natured about most everything. He has to be to live with me! So, I decided to devote this entry to him and share some of the pictures that I (or the wildlife camera) have taken of him over the past few months. Here goes. Getting some help from the chickens while working on the fence. Working out in the snow on a cold winter day earlier this year. Wearing one of his Oklahoma Blood Institute t-shirts that they give him for donating blood. The one above had an OSU theme, hence the orange color. Shelling peas last spring. He has so much more patience than I do! And my personal favorite! Mr Birdfeeder Head.